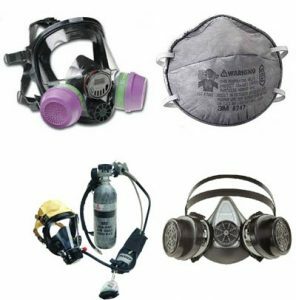 Respiratory Protection and the use of both air-purifying and air-supplying respirators can be a challenging subject, but EHS is here to assist with your respiratory protection needs. If you would like to request a consultation or services please contact the General Safety Group under April Case. Otherwise, please see the safety manual for details. Respiratory Safety Training Guide This document is a worksheet which covers the minimum OSHA required training elements. Respiratory Safety Training Appendix D This document is required to be given to employees who use a respirator voluntarily, where it is not required by degree of air contamination or procedural requirement. Please consult EHS if you are uncertain of your status.